"Nooooo, don't scrape me. I have so much to live for"
So do like we do here at TheJournal.ie HQ and get stuck into a serious debate on one of life’s most pressing issues. This week: So you’ve burned your toast. Don’t panic: all is not lost. If you scrape off the top layer of charred blackness, then there’s still a chance that you could salvage your delicious, delicious bread. But where to scrape the burnt bits? Straight into the bin with the rest of the rubbish? Or into the sink because it’s so convenient? WHAT TO DO? Thanks to reader Dennis Collins for sending us this week’s dilemma, based on a real-life drama in his own home. We feel your pain, Dennis. Vote here: Do you scrape the burnt bits of toast into the sink or the bin? Sink. I don't even feel (that) guilty about it. Bin. I'm civilised, you know. I don't burn my toast. I'm an adult and I can work a toaster. Email “The Burning Question*: Do you scrape burnt toast into the sink or the bin? ”. 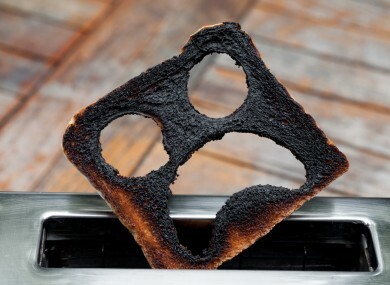 Feedback on “The Burning Question*: Do you scrape burnt toast into the sink or the bin? ”.